First Edition. As new in dust jacket. William Faulkner (1897-1962) once said of his novels and stories, "I am telling the same story over and over, which is myself and the world." This biography provides an overview of the life and career of the famous author, demonstrating the interrelationships of that life, centered in Oxford, Mississippi, with the characters and events of his fictional world. 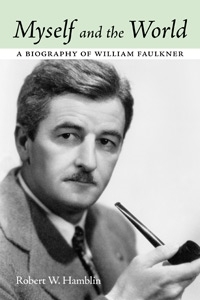 The book begins with a chapter on Faulkner's most famous ancestor, W. C. Falkner, "the Old Colonel," who greatly influenced both the content and the form of Faulkner's fiction. Robert W. Hamblin then proceeds to examine the highlights of Faulkner's biography, from his childhood to his youthful days as a fledgling poet, through his time in New Orleans, the creation of Yoknapatawpha, the years of struggle and his season of prolific genius, and through his time in Hollywood and his winning of the Nobel Prize. The book concludes with a description of his last years as a revered author, cultural ambassador, and university writer-in-residence. In his Nobel Prize acceptance speech, Faulkner spoke of "the agony and sweat of the human spirit" that goes into artistic creation. For Faulkner, that struggle was especially acute. Poor and neglected for much of his life, suffering from chronic depression and alcoholism, and unhappy in his personal life, Faulkner overcame tremendous obstacles to achieve literary success. One of the major themes of his novels and stories remains endurance, and his biography exhibits that quality in abundance. Faulkner the man endured and ultimately prevailed. Robert W. Hamblin, Cape Girardeau, Missouri, is professor emeritus of English and the founding director of the Center for Faulkner Studies at Southeast Missouri State University. A native of northeast Mississippi, he completed advanced degrees at the University of Mississippi in Oxford, Faulkner's hometown. He has directed Faulkner seminars for the National Endowment for the Humanities and the Missouri Humanities Council and has lectured on Faulkner in Europe and Asia, as well as throughout the United States. He has coedited seventeen books on William Faulkner, including a William Faulkner Encyclopedia and A Companion to Faulkner Studies.